COUNCILOR Ma. Lourdes Gaane yesterday sounded alarm bells as authorities positioned to prevent flammable materials and chemicals from being turned into weapons for terrorism here. Gaane, a physician, said she feared the prospects of a chemical attack by terrorists, adding that it was something the local government has not prepared for. “We [would be caught] flat footed and unprepared” in case of such a terrorist attack, she said. The Bureau of Fire Protection (BFP) joined security forces this week in inspecting incoming vehicles for hazardous materials here. It was a response to the recent confiscation of tons of hazardous materials at a checkpoint in Barangay Suarez, Iligan City. The seized chemicals include sodium chloride and sodium hypochlorite that may be used in bomb-making. 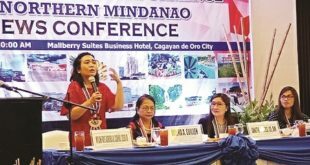 Gaane, chairperson of the city council’s health committee, said she fears that the government would have no counter measures in case of chemical attacks. “Kung inhalation daghan mamatay ani. Admittedly, wala gyud kit’ay mahimo,” she said. Gaane said the city hallun JR Borja Memorial General Hospital, for one, has no capability to handle cases resulting from a chemical attack. She noted that such an attack would be air-borne. She said the city hospital even does not even have an isolation room and an intensive care unit. Councilor Reuben Daba also expressed alarm, pointing out that the local government does not even have chemical suits. “Even facilities, we don’t have any to contain it. Dali ra man lugar kana pero daghan ang madisgrasya. It would only take at least five minutes… a person cannot stand inhaling it for five minutes,” Daba said. The threat, he said, is not only he concern of the military and police but by all sectors. Supt. Lemuel Gonda, Camp Alagar spokesman, earlier revealed that authorities were guarding against the Maute Group and the Bangsamoro Islamic Freedom Fighters (Biff) that could launch a major terrorist attack using hijacked trucks with chemicals or petroleum products. Gonda said authorities were relying on the BFP because it has people trained on the handling of weapons of mass destruction. “Sila ra gyud sa BFP ang atong gisaligan sa pagpugong ani,” he said. In Villanueva, Misamis Oriental, authorities met with representatives of all companies with gasoline stations, fuel tankers and depots during the AFP-PNP Joint Peace and Security Coordinating Council at the Provincial Police Office. The meeting tackled how the firms could step up their security measures and help in preventing flammable items from ending in the hands of terrorists, said Supt. Arden Amogod, deputy provincial police director for administration. 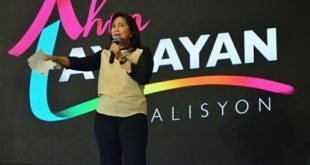 “Angay alerto ang tanan kay naay posibilitad nga ang local terrorists mogamit sa mga flammable item gikan sa mga gas companies og fuel tankers,” said Amogod.